When it’s dark, our imagination has no problem turning every creak or squeak into the most horrifying monster imaginable. Once we’re able to see again, our mind can finally settle down, but being able to see everything around you is a must. If you only have a circle of light from a flashlight to illuminate your area, it allows you to think there’s still a chance that you just haven’t caught the make-believe creature in your line of sight yet. 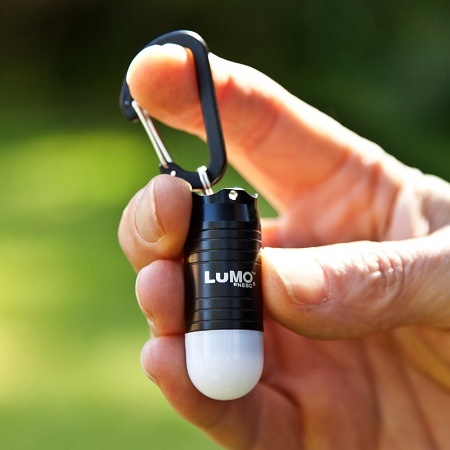 If you’re always on the hunt for more methods of lighting to make sure you’re never left in the dark, then you might like this little Lumo Key Ring Torch. It may be small, but it is mighty thanks to the LEDs it uses to produce 25 lumens that can reach out over 9 feet. That’s surely far enough of a reach to give you some small comfort when you’re trapped in an abandoned warehouse with a murderer on the loose, or in your living room when the power goes out. This is made of aluminum, and comes on a dainty carabiner clip. It can run for 5 hours on 3 LR44 batteries, and comes with 6 so you can at least make it through one night with light. It is impact resistant up to around 3 feet, meaning you can drop it from standing and it won’t break. This will cost you around $8, and is hopefully powerful enough to justify all of the batteries you’ll have to buy. Good price but poor form factor. Those button batteries are very expensive compared to rechargeable AAA’s. I recommend an aluminum single-AAA LED pocket flash like the Fenix E01 instead.